Jazz chants are a unique way of linking the rhythm of natural spoken language to the rhythm of music. Jazz chants were first created by Carolyn Graham, undisputed queen of the genre, over 30 years ago. Carolyn was teaching ESL at New York University by day and working as a singer/piano player in bars at night when, as she has said, she ‘stumbled upon’ the brilliant idea of connecting the natural rhythms of spoken American English with the rhythms of traditional American jazz music in order to help her students develop speaking skills. I learnt about jazz chants early on in my teaching career and quickly discovered what a wonderful way they are to develop speaking skills both with adults (who I was also teaching at the time) and children. I soon found myself inspired by Carolyn to create my own chants to reflect the natural rhythms of the variety of English I speak i.e. British rather than American English, and have been writing them and using them with my classes regularly ever since. The main feature of a jazz chant as opposed to a poem or rhyme is that there is no poetic licence or artificial change to the stress and intonation patterns of natural speech. Jazz chants also often take the form of an interchange or dialogue which display the natural give and take of everyday spoken language. I’m OK. And what about you? Me? I’m fine. I’m fine. I’m fine. On the farm by the river, there’s a sheep. On the farm by the river, there’s a sheep and a duck. On the farm by the river, there’s a sheep and a duck and a cow. On the farm by the river, there’s a sheep and a duck and a cow and a hen. On the farm by the river, there’s a sheep and a duck and a cow and a hen and a horse. Davina likes lettuce but she doesn’t like peas. Does Davina like lettuce? Yes, she does. Does Davina like peas? No, she doesn’t. Freddie likes potatoes but he doesn’t like rice. Does Freddie like potatoes? Yes, he does. Does Freddie like rice? No, he doesn’t. Before using jazz chants in class, we need to establish the context and pre-teach any new vocabulary. It’s also usually a good idea to set one or two pre-questions (e.g. What does Davina like? What does Freddie like? for the grammar chant above) and do an initial listening activity in which children show understanding of the chant. As children say and act out the chant, it can be helpful to use finger or pencil puppets as a prompt for each speaker, or flashcards, for example when children name the animals cumulatively in the vocabulary chant above. At first, you can divide the class in half to take turns to ask and answer questions (if the chant follows this pattern) and then change roles and repeat. As a follow-up, children can practise saying the chant in pairs or groups in preparation for ‘performing’ it to the rest of the class. With some chants, it may also be appropriate to get children to create their own parallel versions. 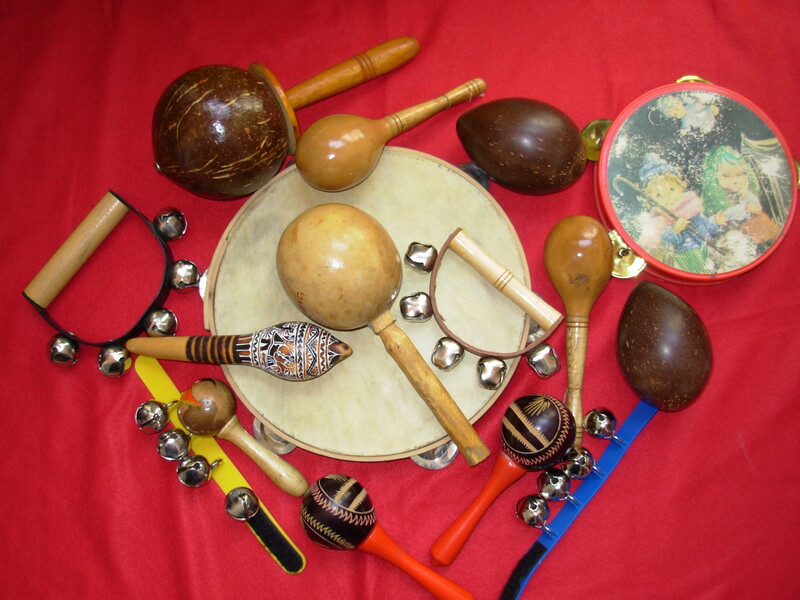 When using jazz chants with children, I like to take to class my collection of percussion instruments (see photo above) which children take turns to ask for (e.g. Can I have the tambourine, please?) and use to keep the rhythm and pace of the chant. This adds extra interest as well as a feeling of creating a spontaneous musical performance together. If you do use percussion, it works best to get the rhythm going with the percussion instruments softly first and then count the children in to four as a cue to start saying the chant. They are motivating, memorable and fun. They add variety to language practice. They provide for lots of natural and enjoyable repetition. They allow for physical movement. They reinforce vocabulary and grammar. They improve all aspects of pronunciation. They develop fluidity and natural speed in speaking ‘chunks’ of language. They provide opportunities for ‘rehearsal’ which helps children later transfer the language to other contexts. They build up children’s confidence and help create a sense of achievement and success. I’d love to hear your views of jazz chants and your experience of using them in class. Please do share! Carolyn Graham has published many books on jazz chants – two examples are Jazz Chants for Children and Creating Chants and Songs (OUP). You can also watch Carolyn Graham talking about teaching jazz chants on Youtube. The greetings chant is from English Club, Carol Read & Sagrario Salaberri, Macmillan. The farm animal chant is from Little Bugs 2, Carol Read & Ana Soberón, Macmillan. The grammar chant is from Footprints 2, Carol Read, Macmillan. Here I am again! I love jazz chants but I just can’t lead them! I have a friend that I team teach with at teacher training workshops and I always ask her to do the chants. I really like them and enjoy them but I just can’t seem to pull them off. I especially like it when we do ’rounds’ this is great when you team teach or can join two classes together. I think they are called ’rounds’. My half sing two or three lines and then your half start. I remember this from primary school. It’s hard work but great fun. We’ve done it with children and adults and had a lot of success. After reading your post today, it reminded me of the good old favourite ‘Shoes and Socks’ which I explained to a fellow teacher, who is going to be using next week in class. Lovely to see you here again! Thanks so much for writing. Great to hear that you love jazz chants although I understand completely when you say you “can’t lead them”. This is also a feeling I’ve sometimes heard echoed in teacher training sessions I’ve done with primary teachers over the years. As with any technique, I think it usually tends to be best that if we, as teacher, don’t feel comfortable using a particular technique then it’s probably best to avoid and not to feel under any obligation. There are also some teachers who have told me that they really don’t like jazz chants, which is fine too. There are plenty of other ways to develop speaking skills after all. On the other hand, if you do enjoy jazz chants – as you do, it can help in leading them to stick to using the recording provided rather than doing this yourself, or to delegate leading each part of the chant to a confident child (once they have heard it once or twice that is). I also find that using percussion, as well as being fun, really does help to keep the rhythm and get children to lift their voices and sound animated rather than dirge-like! Thank you very much also for suggesting the idea of doing a chant as a ’round’. I often do this with songs and can see that it would also work well with chants in the way you describe. I’ve often found that doing ’rounds’ encourages children to work together and really focus and concentrate on doing their bit correctly. In some classes, I’ve also seen children put their hands over their ears, so they don’t get thrown by what the other half of the class is singing (or saying)! ‘Shoes and socks’ (by Carolyn Graham) always used to be one of my favourites too (although I used to adapt and shorten it slightly from the original). In fact, your comment’s reminded me that I have a video of my doing this chant with a class of 6/7 year olds (over ten years ago now!) in which we’re sitting in a circle on the class carpet and do the chant, first time pointing to flashcards and second time, pretending to put on the clothes. Interesting really how a chant like this hasn’t really dated! And hope it goes well for your colleague next week. By the way, I’ve also just had a look at your blog http://www.earlyefl.blogspot.com/ which is great – sorry I hadn’t realized that you had one before and will add it to my list! Thanks again for your great contribution. Thank you Carol, I love reading your posts! I’ve been using quite a lot of jazz chants and rhymes this year with 8-10 year olds and 10-11 year olds. With the older ones I have modernised the term and call them “raps” which goes down really well with children at this difficult pre-teen age. Sometimes I make up my own “raps”, sometimes I borrow them from course books, and sometimes the children write their own. Yesterday we took some song lyrics from a course book and turned it into a rap. Maybe they are not quite the same as jazz chants because the rhythm can be more musical than the natural rhythm of the sentences (if you have listened to hip hop you will have noticed that the rhythm is completely different to real speech). However, you can just take a jazz chant and call it a rap to make it more attractive since the children will always try to follow your rhythm. In my experience, most children have some natural musicality and for this reason I also teach them some useful chunks, e.g for classroom language as a chant or song, as it really helps them to remember the words and use a more natural intonation. Thanks Carol (and Leahn – I have tried rounds but have not been successful with children under eight). Thanks very much for writing – I’m so glad you’re enjoying the posts! I completely agree with you that it’s a good idea to modernize the term – and indeed the whole style and feel of chants – with older children, and use ‘raps’ instead which are a familiar genre that pre-teenagers relate to. This is something I also do. You’re completely right also about the rhythm of raps, which are poetic in a unique kind of way that only partially reflects the rhythms and cadences of natural speech. I don’t think this really matters though in terms of the overall benefits of engaging children in using language in an enjoyable and memorable way, and the ‘cool’ factor at this age is so important in doing this, as you suggest. Thanks also for pointing out the natural musicality of most children and the role of chants or raps in helping children to acquire ‘chunks’ of language, which don’t necessarily need to be unpacked into their grammatical parts as part of teaching. As you suggest, chants and raps are also an important aid to memorization and help with natural intonation (or maybe not quite natural but at least pretty cool, as in raps). I also always love it when children transfer language they have learnt in a rap or chant to another context of their own volition. This always seems a real indication that they have taken “ownership” of that bit of language and it’s become part of their repertoire. I wonder if you also have experience of this happening with your classes? It’s great to hear that you invent your own raps and get children to write their own too. Once you get into doing this, it becomes easier and easier to do based on any language structure or vocabulary you’re teaching or, for example, any short text or dialogue from the coursebook you’re using, or a familiar story. Carolyn Graham has very clear and straightforward guidelines for inventing chants and songs in the second book of hers I mentioned in the post. I know exactly what you mean about the age of children using ’rounds’ and agree with you – children below 8 tend to get confused by the demands of listening and speaking or singing in a staggered way as in a round. Thanks again so much for all these great points. I completely agree with you about blogging being an exercise in professional development. I also think it’s a great opportunity for us to share and discuss ideas in a professional yet informal and relaxed way. It can sometimes be so isolated being a teacher, and communicating through blogs gives us an easy way of staying connected with other like-minded professionals either when we feel like it and/or have the time or have something we want to say or share. It’s also completely egalitarian which is very refreshing. I think it’s a bit premature to call your laughter mad … go for it! First – congrats on this truly splendid blog. Great initiative, and delivered in real style! Great to hear from you and many thanks for your positive comments. Thanks also for sharing these useful links to more on jazz chants and for adding me to your blog roll and recommending it to others too. I enjoy your blog very much and it feels good to be in touch with others writing about YL issues, so very much look forward to keeping up the contact. Interesting to hear that your high school students enjoy jazz chants – especially as this is a tricky age group to please. Carolyn Graham has written jazz chants that are suitable for high school students and adults, although it might be better to use her techniques to create your own so that they’re completely relevant to the students you teach. Raps can also work well with high school students although they need to be chosen with care as the language is often too difficult or unsuitable. If students are familiar with the genre, one idea is to get them to invent and write their own raps or chants based on a specific topic or theme and then perform them to each other. You could lead into this by getting the students to watch a rap being performed e.g. on Youtube and follow this by creating and building up a collaborative rap or chant with the whole class first. I started using jazz chants in my class since I attended a seminar in English and I found it effective motivating my pupils. They love doing it because we usually accompany it with claps and dances. They can now easily construct sentences because they experience it. I am looking forward to be seeing more samples of jazz chants that I can use in my English class. I am teaching fifth graders. I am an English Teacher in one of the public high schools in the Philippines. How I love your JC especially we have big contest this week. I don’t sing but I’m encouraged to do so with your creative technique in teaching English. Hoping to learn more from your style and to get to love singing, as well! Great site! I have had moderate success using both premade and original jazz chants in public school in Japan (12-15 year olds). The intro and practice sessions go well and most students seem to enjoy the chants. The problem is that once we finish the chant and move on to the next part of the lesson, my students tend to abandon the natural rhythm they have just been practicing. Even if the grammar is nearly the same as that in the jazz chant, they begin to focus more on form, and their speech becomes stilted. Have you found a good way to help students transfer the cadence of the jazz chant to other speaking situations (especially those that involve the same or similar grammar targets)? Thanks for any suggestions you can give me! Hi Carol. I am an instructor at Salisbury University in Maryland. I teach for the English Language Institute here, and I have entertained the idea of jazz chants with our beginning/low int. level learners. Any insight into utilizing this method with an older population???? Hi Jess, many thanks for writing. With older learners, I think you need to be particularly sensitive as to whether they enjoy working in this kind of way or feel uncomfortable with it. If the former, it can be a lot of fun to get students creating and writing their own chants (possibly based around particular bits of language or grammar that they find particularly challenging) and focus on the ‘performance’ side, with pairs or groups acting out their chants to each other (often in humourous, exaggerated style) and/or making short film clips using their mobile phones. Carolyn Graham has lots of ideas for Creating Jazz Chants with students in her book of the same name published by OUP. I really love Jazz chants. I strongly believe that Jazz chants is the solution to pronunciation, rhythm and other related problems. Thanks a lot carol. I love teaching by jazz chants , but I am not good at English, how can I make it?